Plymouth University entrants Bird Sunglasses have made it through to the national final of the Santander Universities Entrepreneurship Awards. 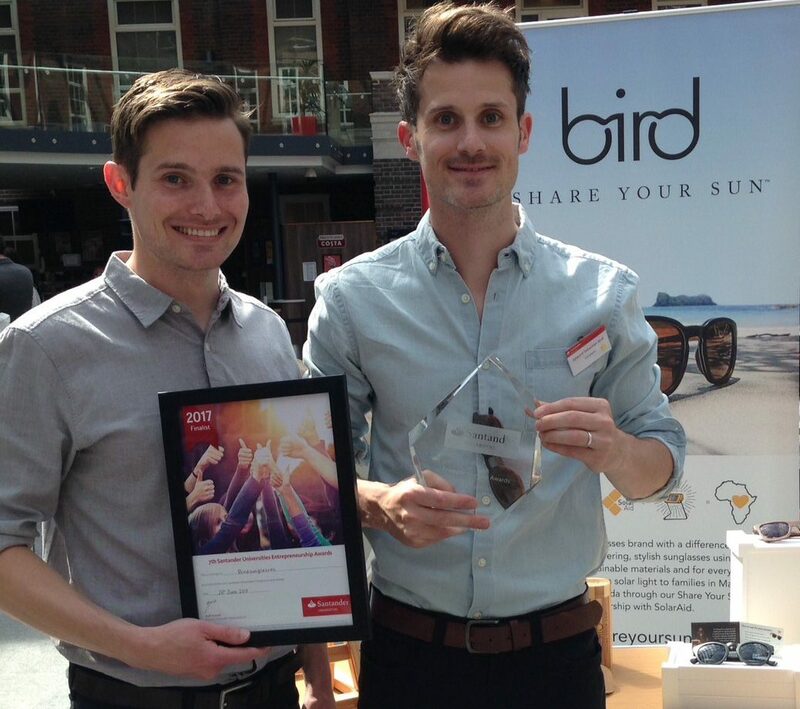 Bird Sunglasses, Plymouth University’s entrant in the pre-revenue category at the Santander Universities Entrepreneurship Awards, have made it through to the national final. Bird Sunglasses, whose Head of Strategy is a Formation Zone alumnus, pitched to a panel of expert judges in an exciting event hosted at Middlesex University last week, and they made it through to the national final stage. The Bird Sunglasses’ founding team includes Plymouth University graduates Paul and Lawrence Bird, who studied Digital Art and Technology, and Graphic Communications with Typography respectively, as well as Edward Bird and Sarah Bird, a true family business. The Bird team will now be invited to a week long accelerator programme run by Santander before going back to London to give a ten minute presentation in the final of the competition this October. If they win, they will take home £25,000 in prize money to help take their business to the next level. In the post-revenue category, One Polygon, based here in Formation Zone, also gave a great pitch at this semi-final event, and were a big hit with the crowd but didn’t quite make it through to the final stage. The One Polygon team, Marcin, Vicktor and Will, have all just finished their degrees in Digital Art and Technology here at the University and have been running their business since their placement year. It may be disappointing not to make the final, but to get to the last 60 when over 2,000 businesses entered the competition is still a great achievement and a testament to the quality of innovative businesses coming through Plymouth University. We’re sure you will all join us in wishing Bird Sunglasses the best of luck in the final!